The ordinance will require certain new construction projects to equip 10% of their parking spaces with necessary electrical components to install an EV charging station. Since a high percentage of the costs of installing charging infrastructure stems from retrofitting (excavating, trenching, resurfacing), this will make the installation of charging stations in the future much cheaper. It also directs the creation of a study to further examine the future charging infrastructure needed to support projected electric vehicle growth. On January 23, 2019, the Miami-Dade County Commission voted in favor of an ordinance to increase electric vehicle (EV) adoption in their County by mandating a certain number of EV charging spaces in new developments. The ordinance, sponsored by Commissioner Levine-Cava, applies to projects in the unincorporated portions of the county and requires new projects with nine or fewer parking spaces to have at least one ‘EV ready’ space. This means the space must have circuitry installed and adequate power designated to accommodate a charging station at a later time. For projects with 10 or more parking spaces, 10% of the parking spaces need to be ‘EV ready’ prior to 2022. This requirement increases to 20% after 2022. The ordinance does not apply to single-family homes, duplexes and townhomes, nor to religious buildings. Nationwide there are currently over 1.1 million EVs, and that number is set to increase to over 3 million by 2025. Florida is home to America’s fourth largest population of electric vehicles; the state has over 30,000 registered EVs. Miami-Dade County has the greatest share of Florida’s EVs: over 4,200. According to a report by the International Council on Clean Transportation, much more charging infrastructure is needed to sustain the transition to electric vehicles, especially in densely populated areas like Miami-Dade. A high percentage of the costs of installing charging infrastructure stems from retrofitting existing surfaces (excavating, trenching, resurfacing). Requiring new construction to come ‘pre-wired’ at a fraction of the cost compared to retrofit and a fraction of the total building costs makes installing charging stations in the future much cheaper. By driving down overall installation costs, this new ordinance will overcome the barrier of inadequate charging infrastructure. Additionally, the ordinance directs the County Mayor (or County Mayor’s designee) to conduct a study and prepare a report regarding the appropriate percentage of required off-street EV parking spaces, taking into consideration factors such as evolving need and demand. 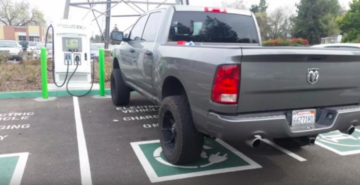 The ordinance also addresses the problem of traditional cars blocking access to charging stations by setting penalties for misuse of parking spaces designed for EV charging. The ordinance has been referred to the Transportation and Finance Committee for a public hearing on February 13th and if passed out of committee, will be back to the full Board for a final vote in early March. If you are interested in providing public comment there is an opportunity at the February 13th meeting which will take place from 2 pm – 5 pm at the Stephen P. Clark Center located at 111N.W. First St., 2nd Floor Commission Chambers, Miami, FL 33128. For additional information contact Daysha McBride at 305-375-1293. Southern Alliance for Clean Energy supports forward-thinking efforts such as this one to decarbonize our transportation system. Electric vehicles significantly reduce carbon dioxide pollution compared to traditional internal combustion engines, and policy solutions like the Miami-Dade ordinance highlighted here increase the infrastructure needed to transition to electric. To learn more about our transportation electrification efforts, click here. To join our network and receive more information, click here.